We have teamed up with BitFenix and Altech Computers their exclusive distributors in Australia to giveaway one Colossus black case and one Survivor case to two lucky Australian Edition readers. Introducing Colossus – the PC chassis for the uncompromising enthusiast. Offering unmatched expandability, security, and cooling all wrapped up in a modern and elegant body, Colossus represents months of intensive research, product development, and meticulous design. The result is a chassis like no other; a chassis that serves as an ideal enclosure for the most colossal gaming rigs. Ruggedized features combined with elegant styling, Survivor is a new paradigm in chassis design. Engineered for the mobile digital warrior, comes fully equipped with BitFenix S2™ security, an innovative carrying handle that hides away when not in use, and full compatibility with extra-long graphics cards. BitFenix's SofTouch™ coating helps the system resist a few bumps on the way to the LAN party, and balanced airflow means Survivor remains cool and stable in the heat of battle. All of this is geared to help you dominate at your next LAN event, rather than worrying about if your hardware will survive the day. 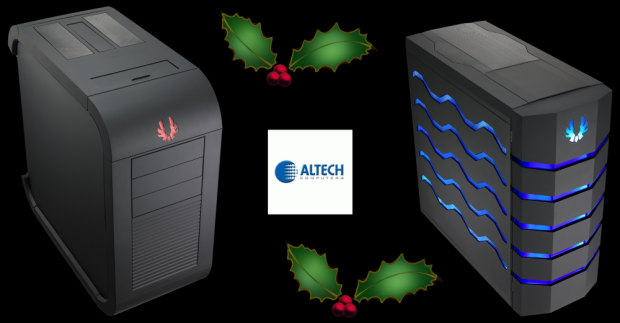 "I want to win the BitFenix Colossus black or Survivor thanks to Altech Computers at TweakTown AU Edition!" You will need to reply to this thread and say that you have subscribed and if you are selected, we will ask for your name to check our YouTube channel. Giveaway runs from today until December 7th 2010 at 10:00pm GMT +8:00 - no entries will be taken into consideration after that time. If you are a winner, you will be asked to provide your full name, address and telephone number for shipping. For this weekly prize, only Australian readers can enter! You don’t pay the shipping charges. If you have friends or family with an Australian address, they can accept the prize for you enabling you to enter. Last edited by Mr.Tweak; 12-01-2010 at 11:03 PM. Already subscribed. The case looks awesome. Posted and Subscribed Gang. Need a new rig, and thats a cool way to start. I have subscribed to the youtube channel! Subscribed and posted. Keen for sure.